Have you ever wanted to view images or a movie on your HDTV but hate the fact that you have to be "wired in", as they say on "The Social Network" movie? Well, now you can wirelessly display anything you want from your computer on your HDTV. It's great for watching movies and being able to control them from your couch, using your HDTV as a second (or larger) monitor, set up wireless projection or presentations, etc. I use it for my photography clients to walk through images via Lightroom. 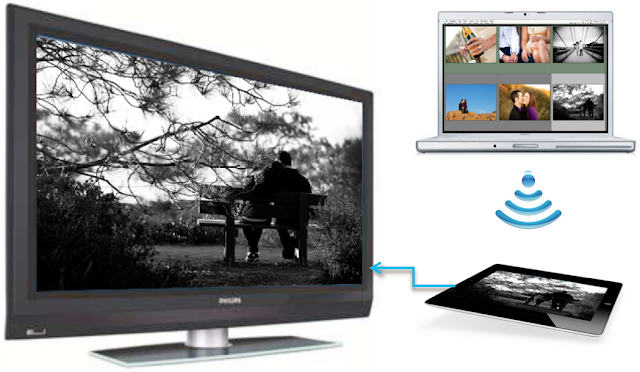 They watch the big screen HDTV and see large images while I can look through my Grid or Develop view on my laptop. Here's a diagram I created to show how it works (photos are real but simulated on the devices). All you need is a computer, an iPad (1 or 2), an HDTV with HDMI input, Air Display and an Apple iPad HDMI adapter. Display anything you want now! Let me know via comments how YOU use this setup! Air Display is a great program works great, i've succeded watching throgh my ipad to mt sony bravia lcd.